This is where it all gets interesting. We are now accounting for the amount of protein in the plant varieties, converting that to the nitrogen and calculating the amount of growth we can gain from the previous nitrogen budget value. We have set the production of plant selection up to 5 different cultivars to get you started. 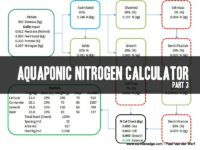 From the previous nitrogen budget calculations you will have a results which indicates how much nitrogen is left for you to spend on your plant growth. Here it is again for you. It does not matter if you have a separate loop or not. Nor does it matter what growing method you use, be it nutrient film technique, deep water culture or even those boggy media beds. The plants require nitrogen to make up the protein content in plants and it only comes from the fish side of the input, from your feed. Unless, of course you have nitrogen available in your source water as previously mentioned, then you have a bonus in the bank! This last part of the calculator allows for up to five different varieties of plants (preferably leafy greens). There is a built in Shoot to Root Ratio of 0.3. We need to recognize when we grow plants we also grow roots that in most cases are not sold or eaten. However, nitrogen is still stored in the roots which we would consider a loss. This is a very plastic number that changes with variety and age of the plant. Considerable effort has been made to ensure the calculations are correct. However with the many different varieties and growing conditions it is not possible for the author to predict every scenario around the world. However the calculator provides a reasonable estimation of the productivity of any system. Small growers will benefit not only from the results but gaining a greater understanding of the design criteria and how an integrated system behaves. Some systems behave how we like and others do not, so do your best to be conservative with your inputs and try not to expect miracles. Or something for nothing… avoid the pixie dust. Let’s get on with the explanation….. Varieties This is self-explanatory. You can name what every leafy green variety of plant you wish to grow. You can add up to 5 different crops to the overall production. Later versions may be released with more options for varieties. If 5 is not enough for you now find similar varieties and adjust the percentage of the stock to suit the additional crops. While not perfect, it will work for estimation. Plant Protein (g/kg) This references the protein content of the selected plant variety you wish to grow. There is a mass of nutritional information online that will give you cultivar protein values for the majority of crops. A simple search for “Nutritional analysis of Basil” or “Protein content of Basil” will net you plenty of results. Be sure to convert any protein content you find to grams per kilo. As much as I would like to have imperial measures it is not practical at this point in time and if there is enough requests, I will release one. The protein in the plant represents the amount of nitrogen the plant has stored during its growth. Sidebar on Plant Protein and Nitrogen: Not all nitrogen in plants in protein. This is called non protein nitrogen and difficult to assess for the many varieties, under various growing conditions. There is an allowance for this nitrogen built into the calculations as per below notes: Further a percentage of nitrogen by mass is bonded in chlorophyll at the center of the chain by magnesium. Chlorophyll in plants allows them to photosynthesize the energy from the sun into sugars. This is what makes plants green, as if you did not already know that. There is allowance built into the calculations for the use of nitrogen in Chlorophyll. Going even further yet, the storage of nitrogen in the form of nitrate in the plant is again a very plastic number and dependent on the growing conditions. Specifically temperature and solar radiation impact the amount of nitrate stored in plants. We can not know your complete seasonal changes so have allowed a percentage of the nitrogen stored in the plant to help increase the accuracy of the calculations. Yes there is more… What is often overlooked when growing leafy greens is the mass of roots that are not often sold but still contain nitrogen and protein. We have also allowed for this root:shoot ratio in the formulas. All of these additional numbers and allowances have a small impact on our nitrogen use in the system. Without accounting for them, at least with broad strokes, we will over estimate the amount of plants we will grow. Total Stock (%) Simply put this is the percentage that particular variety of plant is of your overall production. If you only want to grow lettuce, you would put 100% in the lettuce row and 0% in all other rows. Same thing for two crops you can have 50% of chard and 50% of mint provided the overall percentage of the stock adds up to 100%. Weight Each (g) This is the individual weight per plant at harvest. This will vary for every crop and you should use your own discretion about the harvest weights your plants. This calculator does not account for leaf picking. It assumes when you grow a plant to X grams you will harvest it. Common end harvest weights of commercial crops can be found online. Remember this is metric in grams. Cycle (Days) Regardless of the method used, it takes X amount of days to grow a crop or plant to the expected size. Avoid suggesting you can grow a 500 gram head of cabbage in 26 days. For those with limited experience in the time it takes to grow a product or tasty to eat, most seed suppliers provide the estimated time for grow out in day, generally on their seed packs and brochures. If you have no other data, use the suppliers’ details for this entry. Be sure to subtract the seedling stage. At a commercial level you will have a seedling stage, at home, like us you may be simply planting directly into the growing system. The calculator does not allow for direct planting into the system because seeds will generally have enough energy in the seed to support its germination. It is often best to simply use a length of time from a seedling stage not a seed. That is the extent of the inputs required to get your calculated results below. The Results The results speak for themselves. They are broken up into Days, Weeks, Cycle and year for the number of plants and the harvested weight of the plants. Sidebar on Crop Losses: Keep in mind there has been no allowance for loss of crop in this calculator. If you are planing the financials of your farm it is a good ideal to lose one cycle of crop for each crop per year to give you some room should you have crops fail. In your start up year you will definitely have these failures and best to account for them on paper before hand to be sure you have the cash to survive and do not over promise your market supply. Next we will take a look at the spacing and the end ratios of the farm. This will give us the size of the growing area required and some interesting ratio comparisons for thought…. Joining Earthan Edge membership is easy and gives you full access to all of the previously published aquaponic and aquaculture articles, along with any we publish in the future. 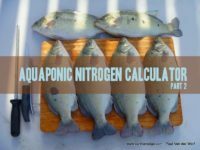 You will have unrestricted access to our calculators and tools, aquaponic and aquaculture designs, hints and tips on managing water chemistry and engineering your own home or boutique aquaponic or aquaculture farm. You will also enjoy discussing your project with like minded people on our members forum. Copyright © 2016 Earthan Group Pty Ltd All rights reserved.